What are some great Client Qualifying questions that I may not have thought of? When booking air with air consolidators, does my client know how much I mark up the bulk/contract/net airfares? I’m trying to book an agent rate and they say I need an IATA card. Do I need to get my own IATA credentials, even if I’m hosted with GTN? Wave Season is real! 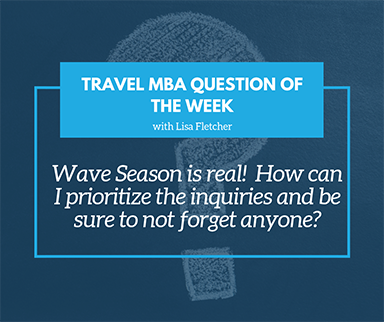 How can I prioritize the inquiries and be sure to not forget anyone?